There are times when it seems like Nevada politics is controlled from outside the state. 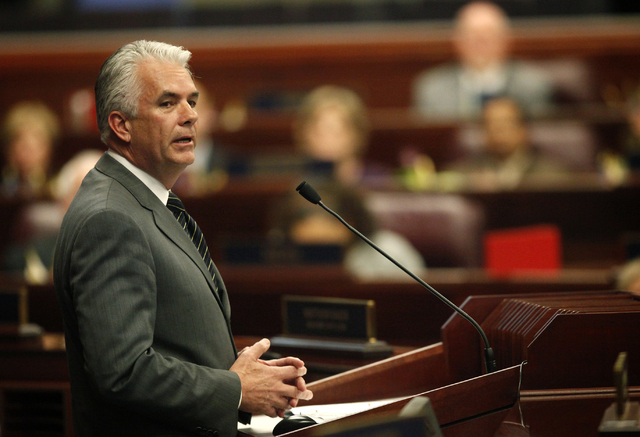 Jessica Ebelhar/Las Vegas Review-Journal This file photo shows then-U.S. Sen. John Ensign, R-Nevada, addressing the Nevada Legislature at the State Legislative Building on Tuesday, Mar. 22, 2011, in Carson City. There was the time when Gov. Bob Miller, running for a third term, was faced in the 1994 Democratic primary by Las Vegas Mayor Jan Jones. Miller was a tired face with a lot of baggage. We’ll never know how it might have come out. In January, President Bill Clinton intruded into the race to endorse Miller. A lot of Democrats fell into line and Jones lost. In 1999, U.S. Sen. Richard Bryan announced his retirement from politics. He announced it early, so candidates would have time to plan. But Republicans never got the chance. John Ensign, who had just lost a race to Harry Reid, lined up the big money and entities in D.C. No other Republican who wanted a future got in their way. Ensign was elected, going on to ignominy. Most states endure this kind of interference. Mello was running with the endorsement of Planned Parenthood and in the most recent state Legislature had voted for PP bills 100 percent of the time. But Perez’s falsehood influenced some other national entities, which withdrew their support of Mello. The dust-up caused his numbers to start dropping. He lost by three percent. This year in Maryland, retired teacher Tanzie Youngblood got into the 2nd District U.S. House race early. She was deeply rooted in the community, raised respectable money, and had an organization. Then the Republican incumbent bowed out, and the Democratic Congressional Campaign Committee got interested. The DCCC hauled out a right-wing Democrat who has a perfect score from the NRA, supports parental notification for abortions, and opposes marriage equality. They’ve dumped a bunch of money on him, infuriating local Democrats. In Texas’s 7th U.S. House district, Laura Moser was one of seven Democrats running when the DCCC actually mounted a full-fledged campaign against her, a DEMOCRAT. Fortunately, it backfired, elevating her to the front ranks and on March 6 she won a spot in the runoff. A slogan started appearing around the internet — “Just Vote for Whoever the DCCC Attacks.” Now, also in Texas, the DCCC is trying to defeat Democrat Lillian Salerno (endorsed by EMILY’s List) in the 32nd House district by backing former NFL football player Colin Allred. In Pennsylvania, 7th U.S. House district frontrunner Rev. Greg Edwards, who started campaigning a year ago, says the DCCC is trying to force him out of the race in favor of white candidates. National Republicans entities usually have the resources to fix their blunders. Democrats don’t.